This study of Jewish cultural innovation in early twentieth-century France highlights the complexity and ambivalence of Jewish identity and self-definition in the modern world. Following the Dreyfus affair, French Jews increasingly began to question how Jewishness should be defined in a society where Jews enjoyed full political equality. Writers who had previously not given voice to their Jewish origins began to explore biblical themes, traditional Jewish folklore, and issues of identity and assimilation. 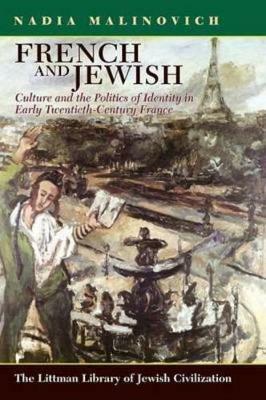 A plethora of new journals focusing on Jewish religion, history, and culture came into being, as did a multitude of associations-literary societies, youth groups, religious organizations-that emphasized Jewish distinctiveness Nadia Malinovich explores this blossoming of Jewish cultural life in France, often described by contemporaries as a Jewish 'renaissance' or 'awakening'. Describing and analysing the emergence of new forms of Jewish associational life, she shows that the interface between the various groups was as important as the differences between them: it was the process of debate and dialogue that infused new energy into French Jewish identity and culture. She similarly analyses the Jewish press and literature to develop a typology of themes, providing a panoramic view of how Jewish identity and culture were discussed and debated among Jews and non-Jews of varying ideological, cultural, and political orientations. Her analysis also provides a vantage point from which to explore the complex ways in which French national identity was re-negotiated in the early twentieth century. During this period, French Jews in effect reshaped the category of Frenchness itself, and in so doing created new possibilities for being both French and Jewish. This is a stimulating and original book that makes a major contribution to our understanding of modern Jewish history as well as to the history of the Jews in France and to the larger discourse about Jewish identities in the modern world.